Carpet cleaning services for offices and other commercial spaces should be regarded as genuine investments into one's business. They are so much more than simple procedures that keep carpets clean. They prolong the life of expensive carpets and even upholstery, and they can even maintain them looking clean and fresh for a longer time. Since carpets and windows are the very first things that a potential customer or prospect will notice while setting foot in your store or office for the first time, you can think of them as your bonus business cards. Use them wisely and make sure they work in your advantage, and not against you. A soiled, stained, worn-out looking area rug will most certainly not do a good job at making a good first impression. On the contrary, it will make visitors feel like they are about to do business with an unreliable, careless business that pays no attention to detail and has no respect for its customers. Needless to say, all workplaces have high-traffic areas where dirt and grime are at home. One good solution for this particular matter would be the use of an intermediary carpet cleaning service. These will not only help keep these areas cleaner, but they can even contribute to the general protection of carpets and expand their life. Prosco can recommend the most reliable commercial carpet cleaning services in your area or zipcode. For a hassle-free commercial carpet cleaning solution, check out the rest of the information below. If you already have a periodical carpet vacuuming cleaning service that comes in once a week and takes care of your commercial space, we have bad news for it: regular vacuuming will not suffice. If you truly wish to get rid of deeply embedded dirt, grime, allergens, dust mites, and other similar contaminants, you will need expert carpet cleaners. These people have the right tools, advanced cleaning products, protective coating and deodorizing substances to help you enjoy clean, fresh, and nice smelling carpets around your office for a long time. The best expert carpet cleaners are the ones that use environmental-friendly carpet cleaning methods. The most popular and efficient of them is steam cleaning, or the use of hot water extraction to reach deep within the fibers. This methods has been proven to be 100% effective at removing even the most stubborn dirt embedded deep within carpet fibers. However, it will do it as gentle as possible, so it won't cause any damage to your carpets. The mix between hot water and professional cleaners injected into the carpets will successfully extract all the dirt, together with the cleaning solution and up to 95% of the moisture. The steam cleaning method is also the preferred commercial carpet cleaning procedure used by carpet manufacturers. While you can personally handle steam cleaning around your office by delegating a few of your employees, it will certainly be a big waste of time and resources. This is especially true if you are managing a large space. Not to mention the added costs of buying or renting a professional steam cleaner. The maintenance and repair costs, the lacking skills and the need to ask your employees to handle the cleaning are all additional reasons why you need professional carpet cleaners. Steam cleaning is also a procedure that does not take a lot of time to be completed. 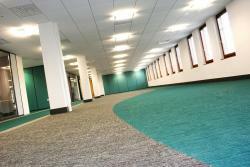 An average carpet found inside an office should not take more than 20 minutes to be thoroughly steam cleaned. Nevertheless, if heavy cabinet files and safes need to be moved in order to reach the entire surface of the carpets, or if the rugs are particularly dirty, the hot water extraction method is likely to last longer. Spot treatments will add even more to the initially estimated cleaning time. Expert commercial carpet cleaners like the ones Prosco can recommend will distinguish between different types of carpets and the materials and dyes they are made of. After close and careful assessment, they will recommend the best approach that will cause zero damage to the carpets. Carpets made of wool or silk need o be given more attention, and this is where the mighty hand of an expert carpet cleaner for commercial customers comes into the picture. One the steam cleaning process is done, the cleaners will apply protector that will maintain the carpets and rugs better protected against dirt, stains, and the regular wear and tear at the office. This procedure is also entirely safe for humans, pets and the environment. It will also add more to the life of any carpet, while getting rid of any unpleasant odors. You can also say goodbye to the annoying static build-up. Get in touch with the friendly Prosco team today and we will make sure to send over the most reliable, fast, and affordable commercial carpet cleaners in town! No matter how simple or complex your carpet cleaning needs might be, we can assist you every step of the way. Call us or send us an online form today and we will get back to you in no time!